Teacher: What must I do in order to deliver 11 potatoes among 7 people? Teacher: Joaquín, tell me the present tense of the verb "to walk"! Pupil: I walk, you walk, he walks. Pupil: We run, you run, they run. Teacher: What is the tense of the verb "it rained"? Pupil: It's a very bad weather, teacher. Teacher: How many hearts we have? Pupil: For sure, sir! Mine and yours. Two students are late at school. The first one explains that he has woken up late. He sais he went to The Polinesia and the travel lasted so much. The second one sais he went to the airport to wait for him. Teacher: Paco, tell us 5 things which contains milk! Pupil: Yes, sir. A piece of cheese and 4 cows. Teacher: María, point on the map where North America is! Pupil: Here is it, teacher! Teacher: OK! Now, the rest of you answer! Who discovered Amercia? The rest of the pupils: María! Teacher: What is a fraud? Pupil: It's what you are doing now. The angry teacher ask him: How is it? Pupil: According to the penal code, all people who take advantage of the ignorance of the others in order to damage him/her, commits fraude. Teacher: Juanito, say to me sincerely, Do you pray before eating? Juanito: No, madam, I don't need it, my mother is a great cook! Teacher: Arturo, your writing about your dog is identical to the writing of your brother. Have you copied it? Arturo: No, teacher, the fact is that the dog is the same. 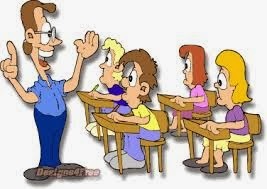 Teacher: Carlitos, how is the person who continues talking although the rest of the people aren't interested called?